Qualifying for next season’s Champions League remains a tall order for both Werder Bremen and Bayer Leverkusen after they shared the spoils this afternoon following an evenly-contested match. Claudio Pizarro’s goal midway through the first-half didn’t quite come against the run of play, but Robin Dutt’s Leverkusen had been by far the better side in the game’s opening quarter. A half-time substitution and formational change revitalized Leverkusen, putting them back in the driving seat, and the visitors deservedly grabbed an early equalizer from a corner after a Tim Wiese mistake. Erin Derdiyok and Lars Bender looked particularly dangerous for the visitors thereafter, but neither side could grab a winner, despite having a plethora of chances in the closing stages. The result keeps the sides in fifth and sixth places respectively, and five points behind the side currently sitting ‘last’ in the top-four, Borussia Mönchengladbach (who are yet to play this weekend). The second round of the new Bundesliga season concludes this afternoon with a game between two of Germany’s bigger clubs. Yet, whereas Bayer Leverkusen would seemingly be the one currently on the up, Champions League campaign and all to look forward to, they’ve made a poor start to the season: losing 2-0 to Mainz last weekend on the opening day, and 4-3 to Dynamo Dresden in the cup a fortnight ago. Werder Bremen, on the other hand, avenged their 3-2 loss to Kaiserslautern on the final day of a forgettable 2010/11 campaign by beating them 2-0 last weekend, although the Saturday before that, they too exited the cup to lower-league opponents, going down 2-1 to Heidenheimer. Wolfsburg secured a vital win away at a relegation rival to haul themselves out of the drop zone and ensure Werder Bremen endure a nervy final two matches of the campaign. The sides who finished third and second respectively in last season’s Bundesliga played out a carefree and thrilling 1-1 draw on Saturday evening – a result that nigh-on confirms both sides’ places in the top division next season. 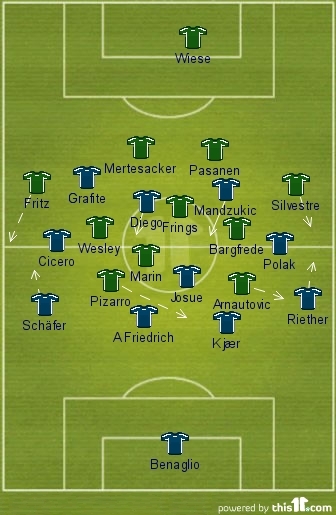 The general first half formations*. 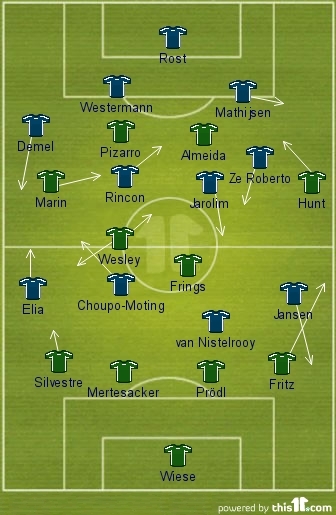 * = Silvestre was actually at left-back, and Pasanen at left-sided centre-back. Two sides still too far away from mid-table security played out an entertaining, chance-heavy and yellow card-ridden 1-1 draw. 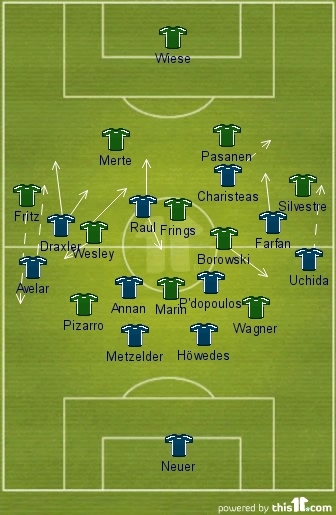 Although Werder Bremen perhaps deserved the win on the balance of play, the fact they were held to a draw is unsurprising given that the last clean sheet they kept in the league was on December 4, 2010 against Wolfsburg. Matchday six in the Bundesliga, and the Saturday evening tie saw northern rivals Bremen and Hamburg square up. Hamburg began the clash in seventh place on eight points, while Bremen found themselves in the division’s penultimate place on a mere three points. Meanwhile, neither of these sides had impressed in the midweek round of fixtures, with Bremen humiliated at Hannover, and Hamburg brushed aside by Wolfsburg. So perhaps the watching world shouldn’t have been too surprised by this match taking a while to get started. Both teams sought to give every man in the same colour shirt a touch of the ball, as each tried tempting the opposition out of position. As patterns and pace finally emerged, the visitors looked more comfortable initially. 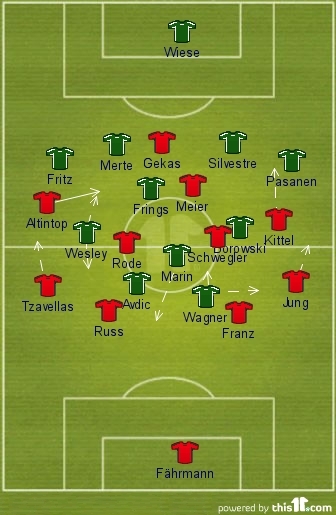 Confident first-time passing moves were being strung together, often only thwarted at the final stage by Bremen’s snappy offside-trap.